"You're hired" isn't the simple statement it used to be. In the quarter-century since the U.S. government began requiring employers to properly document every paid employee's eligibility to legally work in the United States, the landscape of I-9 compliance and management has changed dramatically. The changing face of I-9 compliance, audits and penalties over the past few years. Why many companies - especially those with a decentralized workforce - are wise to take a fresh look at what those trends mean for them. Why an automated I-9 management system for hiring makes sense in response. What you need to know if you're considering an automated I-9 solution. This informative paper from JobApp, the talent acquisition and management solution dedicated to companies with a decentralized workforce, is particularly timely right now. The U.S. Citizenship and Immigration Services (USCIS) in March began seeking public comment on a newly redesigned two-page version of the I-9 that is expected to be issued as soon as August 2012. 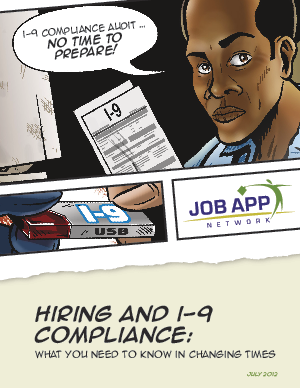 "Hiring and I-9 Compliance: What You Need to Know in Changing Times" is based on reporting of recent trends, interviews with experts in I-9 compliance and hiring processes, and the uniquely dedicated experience of JobApp in this area. This paper adds further value to the discussion about automated I-9 solutions by addressing head-on some of the myths about them and what to look for in an automated I-9 solution. It also explains why even with a paperless I-9 solution, a company can sometimes fail to comply with the federal law.